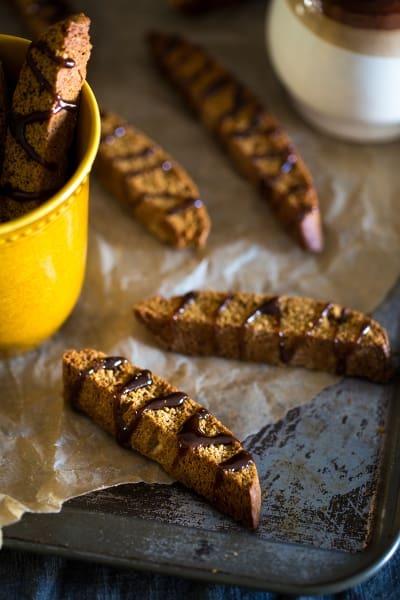 Gluten Free Gingerbread Biscotti has a glaze you'll swoon over. Your morning never tasted so good! You guys. It’s your morning cup o’ coffee’s new BFF FOREVER. 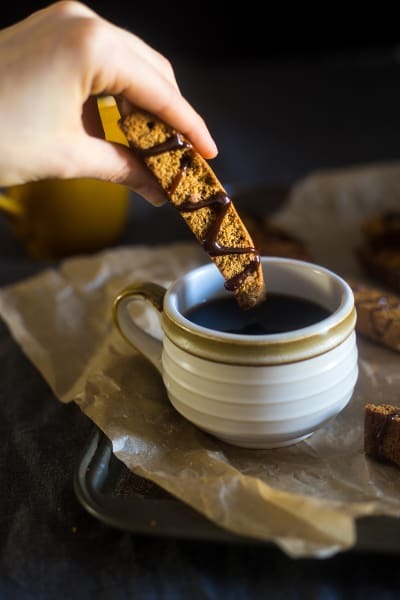 I mean, a cup FULL of steaming-hot joe and a few crispy-crunchy fall-spiced, gluten free gingerbread biscotti, all cuddled up in a cozy blanket on Christmas morning. You down WIDAT? Why can’t my Christmas dream life be my actual REAL LIFE every single day. I want to start every morning like THAT. The world would be so much happier dontcha think? Who doesn’t love healthy oatmeal cookies baked to snappy-crunch perfection that just so happen to be the PERFECT dunk-able shape. PLUS, there’s the whole “coffee glaze” thing. Coffee SQUARED guys. 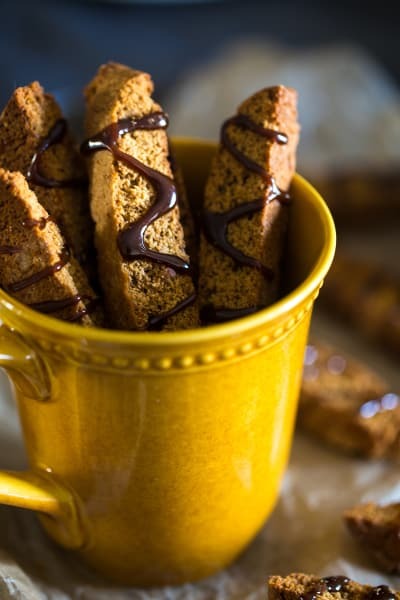 SEE, these biscotti are just MADE for your hungry little morning-munchin’ mouths. I believe #firstworldproblems is appropriate. But enough moaning and groaning and complaining. There’s spicy-sweet gluten free cookies waiting for you to love them. Now the name of the biscotti game (hi poetry!) is CR-UUUU-NCHY. Like put it in your mouth, BITE down and here the SNAP kinda vibes going on here. 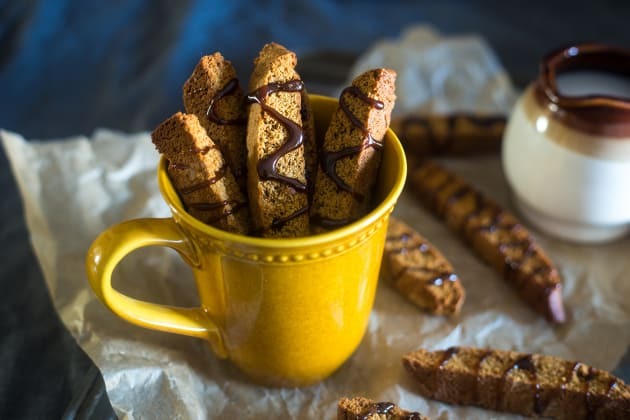 Do you know what biscotti actually means? “Twice baked” in ITALIAN. 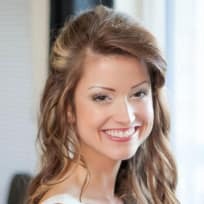 Which is the language of love. And cookies are my language of love, so really it just makes sense. Also, I could be wrong about that meaning. I DID google it. But that was when I made a biscotti recipe LAST year, and I THINK that was my findings. BUT, I’m too lazy to go open my browser. Again, #firstworldproblems. You get me. Good news: you don’t have to see if I’m right. 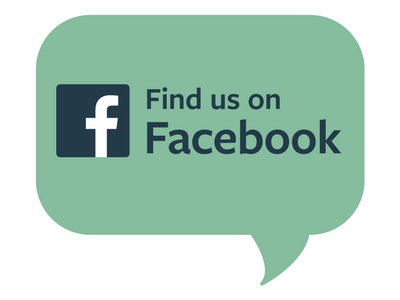 We’ve established trust and bonding and all that good stuff, so you can take my words as TRUF. Anyway, we were discussing super-cruuuuunchy-twice-baked deliciousness with spicy notes of cinnamon and ginger yes? 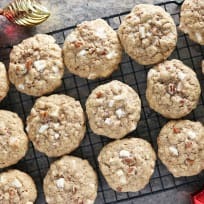 IE: Super cozy Christmas cookies that make your house smell like the epitome of all things fresh-baked-Grandma goodness. Not like you’re BAKING your Grandma. Just like those kid memories of what her house SMELLED like. UGH, you people are too literal. 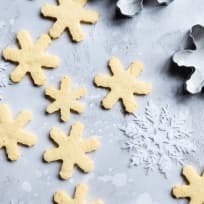 What I’m trying to tell you is you’re going to bake these cookies TWICE. Then, we bake until JUSTTTTTTTT a little bit crunchy. Don’t get all crazy on me, you still need these to be sliceable. See step 3. GENTLY slice on a DIAGONAL. OR else they’re short and weird looking. WHICH could mean you’re embarrassed to serve them on Christmas morning. WHICH MIGHT NOT BE A BAD THING. I’ll let you be the judge. BAKE BAKE BAKE. Make sure to flip ‘em over half way through! No one likes am unbalanced biscotti YOU KNOW. No, I do not. You are perfectly capable, I KNOWS IT. BUTBUTBUT, you COULD over-boil the glaze. Like, super easily. LIIIIKE, I did it the first couple times of testing. Which just means your glaze is more like WHOA-SUPER-THICK-CARAMEL-TOWN. 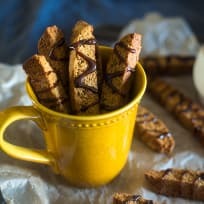 Which is not the worst thing to ever happen to planet biscotti or anything, it’s just a little bit sticky-to-the-top-of-your-mouth. Word of caution: I know Charlie Brown Christmas is on TV on repeat, but IT CAN WAIT. Pay FULL attention – we’re talking ALL eyeballs here – on the glaze. Boil it JUUUUUST until it coats the back of the spoon. Kind of like the color of biscotti. Which you should probably get it making RIGHT NOW. 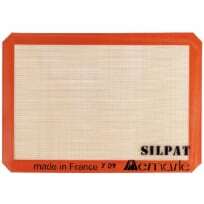 Preheat your oven to 325°F and line a cookie sheet with a silpat or parchment paper. 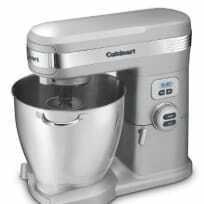 In a medium bowl, stir together the oat flour, baking powder, cinnamon, ginger and salt. Set aside. 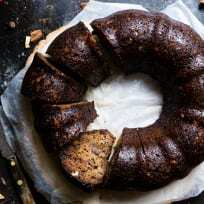 In a large bowl, using an electric hand mixer, beat together the coconut oil, coconut sugar and molasses, scraping down the sides as needed. Add in the egg and vanilla extract and beat until creamy and well combined. Add the oat flour mixture into the sugar mixture and stir until a very sticky, wet dough forms. Scrape the dough onto a large piece of saran wrap, form it into a disc and refrigerate for 20 minutes. Once your dough is chilled, roll it on a lightly oat-floured surface until it is a 12-inch-long log. 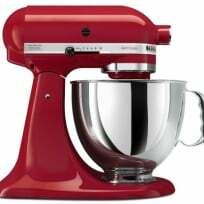 Press the dough down until it is about 1/2 inch thick. GENTLY lift the dough onto the prepared pan. If it miss-shapes at all, just reform with your fingers once it’s on the pan. Bake the log until the edges are JUST golden brown, and the dough starts to form a crust, about 24-25 minutes. 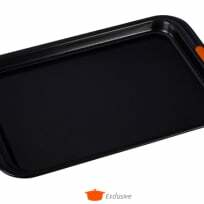 Remove from the oven and let cool on the pan for 5 minutes. 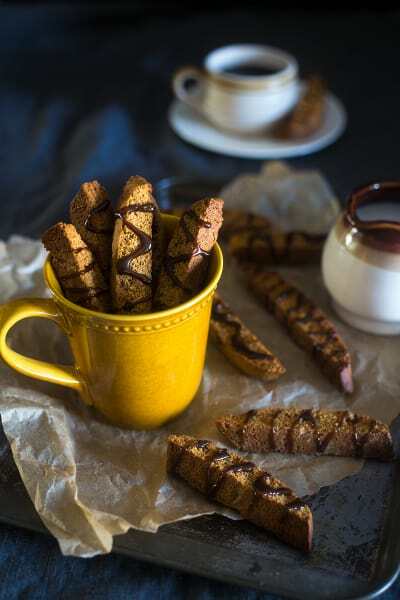 Once cooled, using a very sharp, serrated knife slice the biscotti on a diagonal, about ¾” inch thick. Slice VERY carefully so that the biscotti do not crumble. I found it easiest to start my knife at the outer edge of the biscotti (when cutting the diagonal) and working in, as opposed to slicing the middle and working out. Gently lay the biscotti flat on the pan and bake them again until they are golden brown and dry, about 13-14 minutes, flipping once half way through the baking time. Let cool on the pan completely. Once the outsides of the liquid just begin to boil, add in the 1 tablespoon of coconut oil and stir quickly until the coconut oil totally melts. Once melted, boil the mixture two minutes, stirring constantly. Then, turn the heat down to medium and cook the glaze for an additional minute, stirring constantly. It should be thick and able to coat the back of a spoon. Immediately transfer the glaze to a small bowl and coo for 25 minutes, to allow the glaze to thicken. 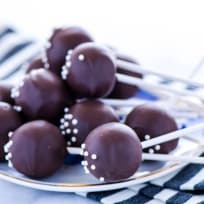 It sounds odd to not stir the ingredients, but I’ve tried it with and without stirring and it does affect the texture of the glaze. The glaze will FULLY harden overnight so you can make them the biscotti in advance, or just eat them as is!